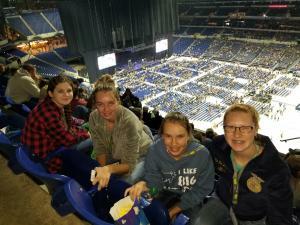 Four students had the opportunity to represent the Chugwater FFA Chapter in Indianapolis, IN at the 91st National FFA Convention from October 22-27th. Over 60,000 members from across the United States, including Puerto Rico and the U.S. Virgin Islands were in attendance! Megan Sagner was our sole competitor, presenting a project in the Agriscience Fair, finishing 8th in the nation in her division! The other attendees were Caitlyn K., Allie Van Why, and Nicole Sagner. The trip was filled with incredible experiences, including a tour of the Louisville Slugger factory and a morning spent at Churchill Downs. 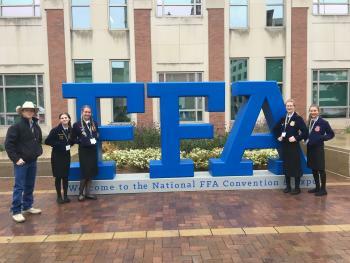 During the convention, members had the chance to attend workshops of their choice, consisting of topics ranging from leadership to beef advocacy. We also listened to the top four Creed Speakers in the nation, including the National Champion who is from right here in Wyoming! A Garth Brooks concert in the Lucas Oil Stadium topped it all off. Overall, the trip was filled with good food, great people, once-in-a-lifetime experiences, and unforgettable memories.